From up here (in a gondola) Ortisei seems like little Whoville down in the valley. village far below, and imagined the Grinch careening down the steep slopes to return the Christmas treasures. 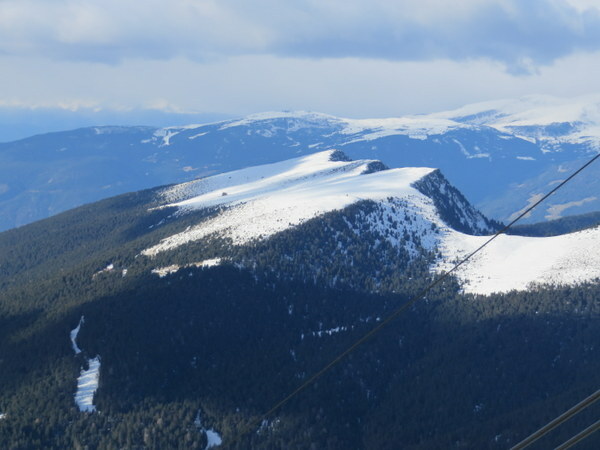 Instead we saw skiers launching off the mountain and enjoying a run of several kilometers albeit on mostly artificial snow. Ortisei calls itself Il Paese di Natale, and celebrates for 25 days, right up to Epiphany on January 6. They like Christmas a lot. We spent a lovely Christmas Day in the Alpe di Siusi (if we are Facebook Friends you have already seen a few pictures from that hike), and on Santo Stefano (Dec. 26) we followed a local alpine guide from the Catores group on a hike to the Church of San Giacomo, which turned out to be a pretty good workout of 2 ½ hours roundtrip. I am pleased to say we old timers were not the slowest ones on the uphill stretch. 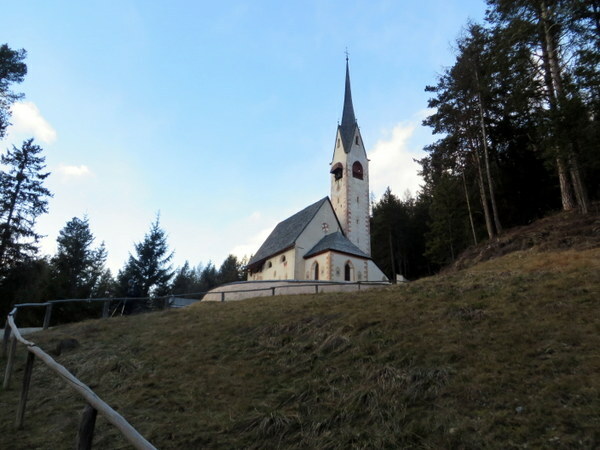 Dating to the 11th century, far above Ortisei. My Swedish ancestors were still practicing Norsk Mythology at that time, I think. 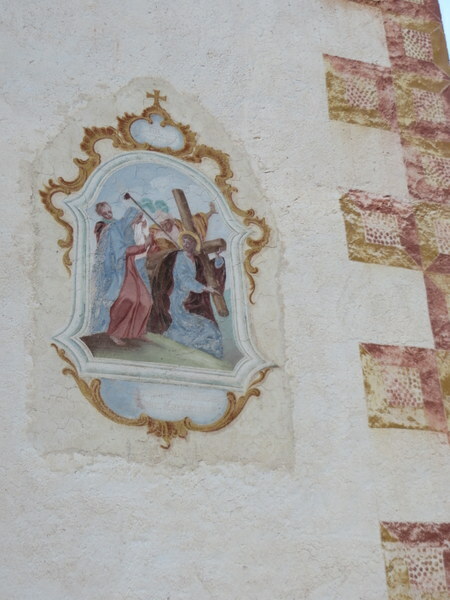 Fresco on San Giacomo, 15th century! There is also a quaint cemetery with a view to “die” for. We also spent part of the evening in Ortisei to see the activity during the passeggiata and the fairy tale-like village transformed by holiday lights. The Mercatino di Natale bustles even the night after Christmas. What some countries call Boxing Day is Santo Stefano in Italy. The crowds are festive! There are welcome warming fires scattered about. La piccola chiesa in Ortisei, simply adorned. There are 4 ice trees. illuminated from within. These are placed in the rushing river that runs through Ortisei. Luckily we are able to be active (as was the point of this trip) to compensate for the amazing food we are consuming at Hotel Albion. We are staying at what is for us one of the nicest places we have ever stayed. I would compare it to Salishan Lodge on the Oregon Coast in terms of elegance, although the Albion has a decidedly ski-sport bent versus the golf club sophistication at Salishan. On a normal trip we stay in B&Bs, apartments and small hotels with a goal of spending no more than EURO 100.00 per night. Usually we are successful at that budget number on an average basis, and sometimes we get breakfast included. In planning this holiday trip, a gift to ourselves in lieu of stuff, we wanted to be a little pampered and stay somewhere special and memorable. I agonized over several choices in Ortisei, and while this one is expensive, it is half the price of the high-end properties here! Like many European resort hotels, the meals are included in a half-pension plan. Breakfast and dinner are included and are beyond ample. Breakfast offers almost every kind of fruit, a make-your-own juice bar, several choices of breads, pastries, eggs, sausages, assorted salume from speck to cotto, mortadella and salami, yogurt, muesli, jams, a honey bar (6 options! ), a dozen types of cheese, and I would venture at least that many types of butter, flavored and not. This is the Tyrol and the northern influence on cooking brings butter to the forefront. Dinners are five courses including an amazing over-the-top salad buffet and an ever-changing menu of primi and secondi. We’ve enjoyed fish, shellfish, venison, quail, veal and duck as well as beautiful vegetarian dishes. I could go on but I won’t. The clientele are from all over, although I am certain we are the only Americans on the property and probably the only native English speakers. Christmas morning we enjoyed hearing greetings of Joyeux Noel, Fröhliche Weinachten, and Buon Natale. There is a shuttle to take us on demand to the lifts or to the village center. There is a spa including outdoor heated pool, which we have not had time to try. The only thing missing was snow, until today (Saturday) when it started during our hike and continued for about 8 hours. Steam rises from the infinity pool while snow falls. Our table at Hotel Albion, overlooking tiny Ortisei. Ric said I needed to be seen in something not pink. See? I have a blue fleece too. Here you see the plateau we hiked on Dec 24, Rasciesa. 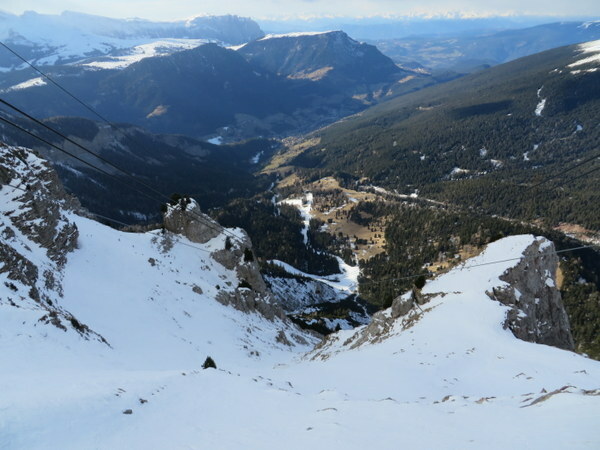 The view is from another peak, Seceda. The little black square is the rifugio where we ate lunch. See prior post. Until the next time I think of something to say, Auguri e Buone Feste from both of us! May you have a blessed Anno Nuovo. Happy New Year Laurel and Ric! What a wonderful place to spend it. I’m so impressed withhow much you are doing and seeing in Italy. Glad you splurged for this hotel and glad we get to enjoy it vicariously through your post! Buon Anno Karen! If you think we have traveled a lot so far, wait until you see us in retirement! Buon Natale e Felice Anno Nuovo. Have a wonderful vacation. Grazie, Chloe! Unfortunately we are headed back home today…But since home is Rome, it’s still as adventure! Buon Natale e Felice Anno Nuovo. Enjoy your vacation. I can picture this lovely Whoville and was very excited you also got the snow too! Thank you Marcia! Happy New Year to you! Maybe we can see you in August.